The CPF is a mandatory social security savings scheme funded by contributions from employers and employees in Singapore. The scheme makes it mandatory for the employer to contribute to the CPF for all the local employees such as Singapore Citizens and Singapore Permanent Residents who earn over SGD50 per month. The highest contribution rate for the employer is 17% and for the employee is 20%, and it could be lower based on factors like the age and permanent resident status of the employee. All Work Pass holders are exempted from this scheme. You may wish to visit Central Provident Fund (CPF) or to use Employer related various Calculators online for detailed information and current updates. You should apply to e-submit your CPF contribution details using CPF e-Submit@web as soon as you intend to hire your first employee. To apply, you will need your SingPass/CorpPass and entity’s Unique Entity Number (UEN). Once your application is approved, you will be notified via email. You will also receive a hardcopy welcome letter which contains your CPF Submission Number (CSN) and a Direct Debit Authorisation form. Please quote your CSN when transacting with the Board e.g. paying CPF contributions or corresponding with CPF Board. You have a grace period of 14 days to pay the CPF contributions after the end of the month for which CPF contributions are due. If the last day of the grace period falls on a Saturday, Sunday or Public Holiday, CPF must be paid by the next working day. After your payment has been processed, you will receive an email notification to view the electronic Record of Payment (eROP) from our website. Please note that a hard copy ROP will not be sent. What is the CPF Submission Number (CSN)? For individuals hiring foreign domestic workers or individuals who are self-employed, the CSN is the individual’s NRIC/FIN. If you hire employees, you will need to make CPF contributions for them. This will help your employees meet their retirement, housing and healthcare needs. How do I determine CPF contributions? Find out which wage payments attract CPF contributions. Classify wages as ordinary wages and additional wages. Apply the CPF contribution rates​. What is the definition of an Employer? any manager, agent or person responsible for the payment of wages to an employee, on behalf of an employer. any Singapore Citizen who is employed under a contract of service or other agreement entered into in Singapore as a master, a seaman or an apprentice in any vessel where the owners have not been exempted from the provisions of the CPF Act. 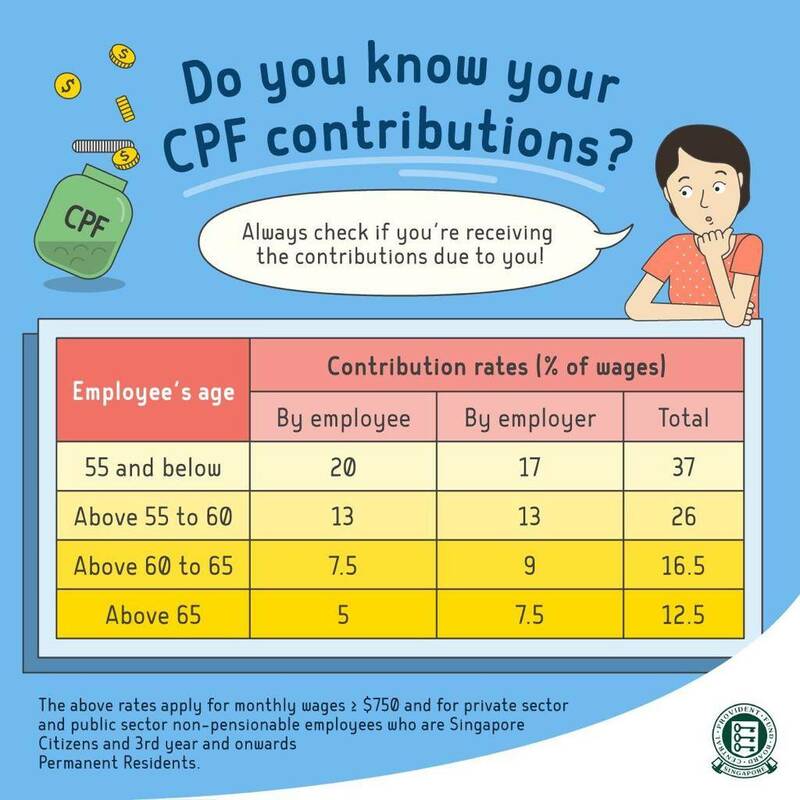 Find out more about who you need to pay CPF contributions for (PDF, 0.3MB). 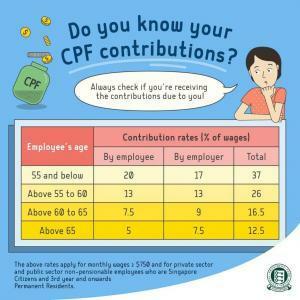 What are the current CPF contribution rates? The Government has announced the increase of the CPF contribution rates in the Singapore Budget 2015. This increase will apply to the wages earned from 1 January 2016. To find out more about the changes, please refer to the Singapore Budget 2015 CPF Initiatives. Please refer to ​below Table A2 for the CPF contribution rates from 1 January 2016 for private sector and public sector non-pensionable employees being SPR during the first two years of obtaining SPR status. The CPF contribution rates with pensionable and non-pensionable wage components are found in the CPF Contribution Rates Table(PDF, 0.1 MB). Please refer to ​below Table B2 for the CPF contribution rates from 1 January 2016 for public sector pensionable employees being SPR during the first two years of obtaining SPR status. What payments attract CPF contributions? It depends on the type of wage payments your employee receives. Besides the monthly salary and annual bonus, an employee can receive other types of payments when carrying out his work. Find out more about the allowances and payments that attract CPF contributions (PDF, 0.3MB). How do I classify wages as Ordinary Wages or Additional Wages? CPF contributions are computed based on an employee’s total wages. The total wages for any calendar month is the sum of an employee’s Ordinary Wages (OW) for the month and the Additional Wages (AW) paid to him in that month. What are Ordinary Wages (OW)? An example of OW is the monthly salary. What is the Ordinary Wage ceiling? The Ordinary Wage (OW) Ceiling limits the amount of OW that would attract CPF contributions. The OW Ceiling is capped at $6,000 currently. For example, if an employee’s OW for a calendar month is $6,500, his CPF contribution would be computed based on an OW of $6,000; CPF contribution is not required on the remaining $500. What are Additional Wages (AW)? Examples of AW are annual bonus and leave pay. What is the Additional Wage ceiling? The AW Ceiling is applied on a per employer per year basis. Employers are required to monitor and limit the contributions on Additional Wages of their employees. This is to prevent refund of excess payment and avoid situations where refunds cannot be made due to insufficient funds in their employees’ CPF accounts. However, employers may apply for a single AW Ceiling for transferred employees within two related companies. You can compute the AW ceiling for your employees using the Additional Wage Ceiling Calculator. Learn more on the computation from the Examples on the Computation of AW Ceiling (PDF, 0.6MB)​. What are some examples of mistakes made by employers when determining CPF contributions? Read more examples of mistakes by employers (PDF, 0.5MB). CPF Board is the collecting agent for contributions to self-help group (SHGs) funds and SHARE donations. These contributions and donations are deducted from your employee’s wages together with the employee’s share of CPF contribution.